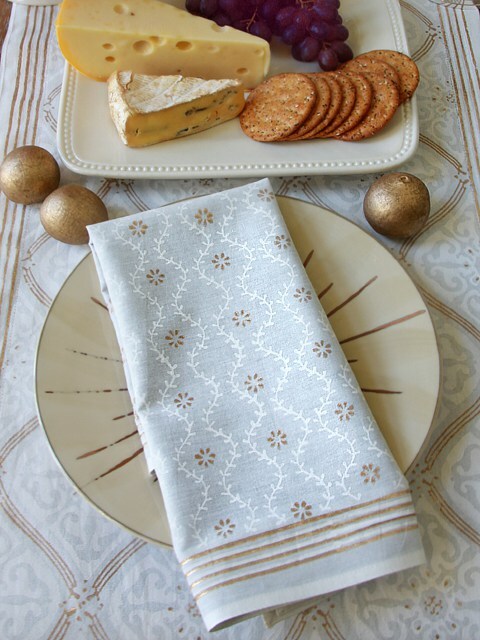 Blog » Shopping Guides » Thanksgiving » Showcase Your Style with Handmade White Table Linens! Sometimes all it takes to unleash your creativity and paint a perfect picture is a fresh blank canvas. Our Ivy Lace table linens are just that. White vines on an ivory backdrop offer limitless decorating possibilities. Be it earthy reds and oranges, or the sensuous golds and greens of this season, wrapping your decor scheme around the print is easy. Today we’ll create three unique looks with one print: Ivy Lace in Natural, Handmade, and Global. Take your pick, or mix a bit from all three! White and ivory are colors that make a frequent appearance in natural decor, which can turn your home into an earthy escape when combined with warm natural and botanical motifs. Use pieces that have ‘soul’ and elements that have an elegant, simple appeal. 1. 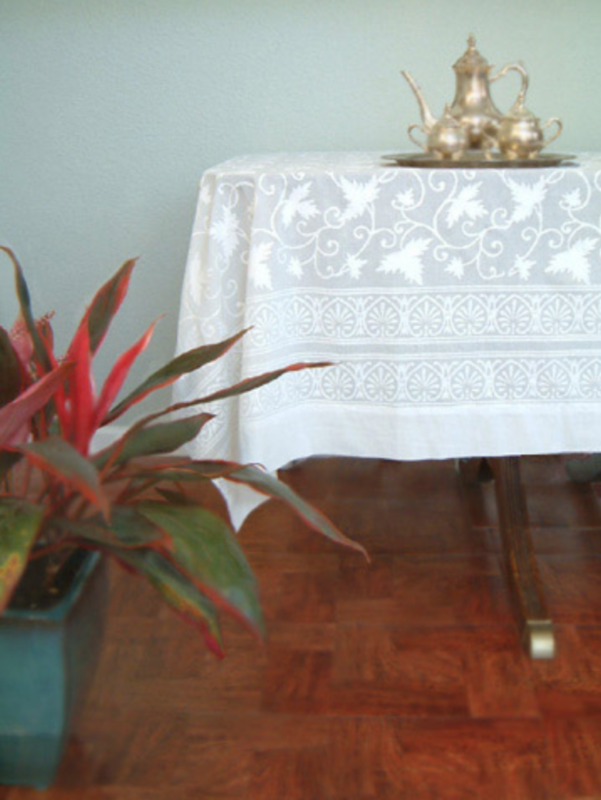 Ivy Lace Tablecloth. Ivy Lace is so much more than just another white lace tablecloth. Hand made, and artist designed, it will enhance and highlight everything in the room! 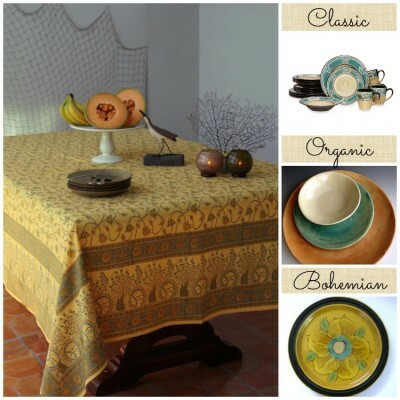 All Saffron Marigold tablecloths are 100% cotton, (no polyester here!) and made with the highest quality materials and practices. This kind of quality underscores your whole design, without calling undue attention to itself. 2. Vanilla Glacé Dinner Napkins. Dreamy and decadent, these napkins will add just the right amount of gilded glamour to your table and will beg to be touched. Napkin rings in bronze or with a gilt finish will really set them off. 4. Starry Nights Dinner Napkins. Is there anything more naturally gorgeous than a clear, star-filled night? 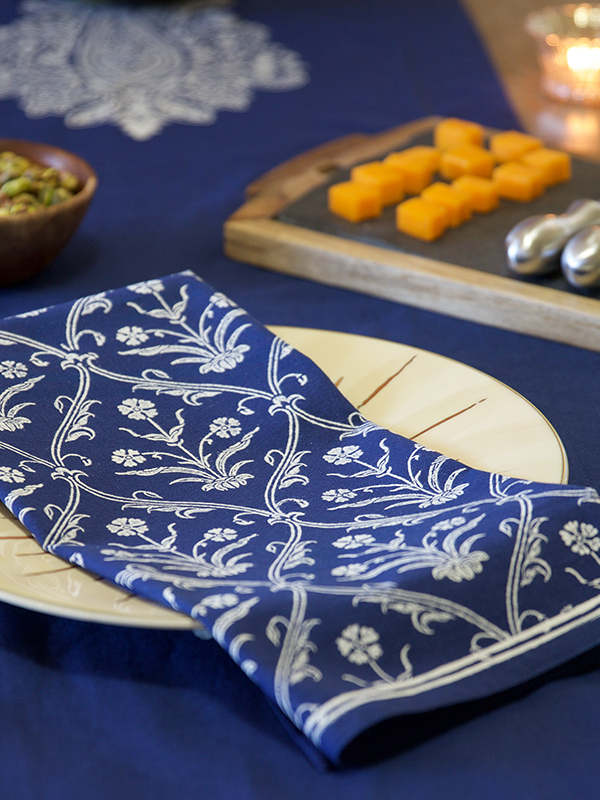 Bring a little of the sparkle of creation to your table with deep indigo and white napkins atop crisp Ivy Lace. Done well, decorating in a neutral pattern creates a space that is soothing, sophisticated and warm. The trick is to mix varying shades of white (think taupe, cream, and grey). Keep accessories warm, and introduce textures like wood, slate, and stone for a nature-inspired palette. 1. Bridal Veil Curtain. 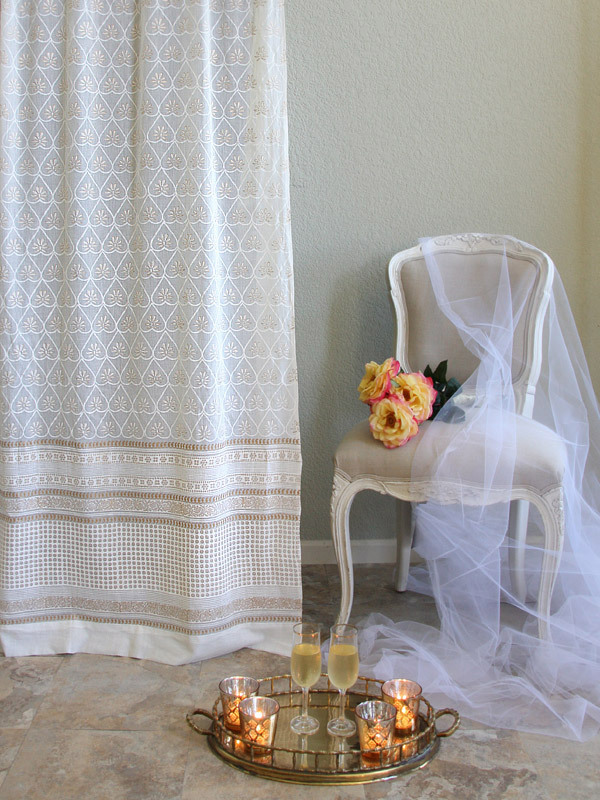 Consider these soft beautiful curtains for the windows. Like a spider’s web, let the delicate, gossamer pattern weave a web of magic and enchantment in your space. 2. Marin Dinnerwear, Crate and Barrel. 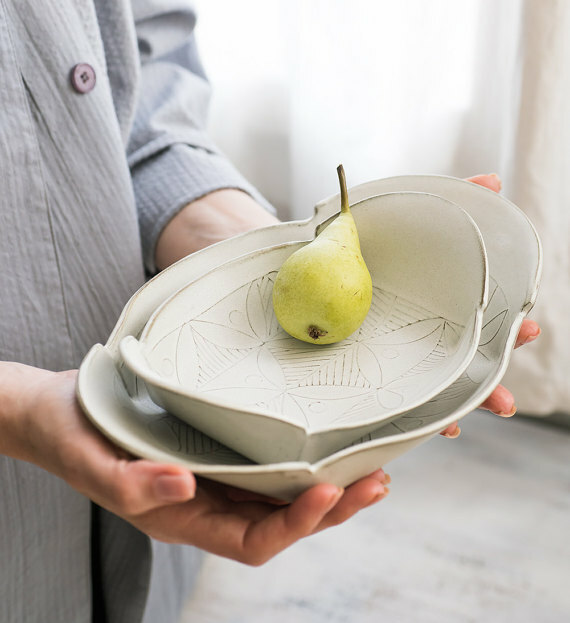 The creamy earthenware is set apart by the organic edge: simple, yet distinctive. So perfect for your natural table decor. 3. Flickering Birch Candles, Pottery Barn. 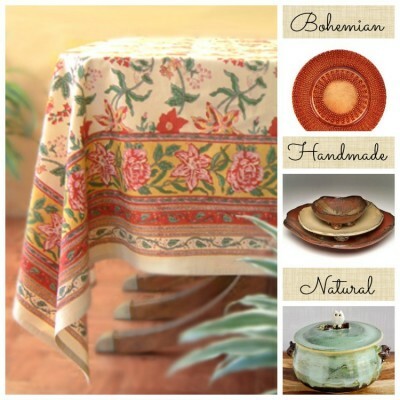 Natural and simple – your table will shine when you weave these principles into your decor. 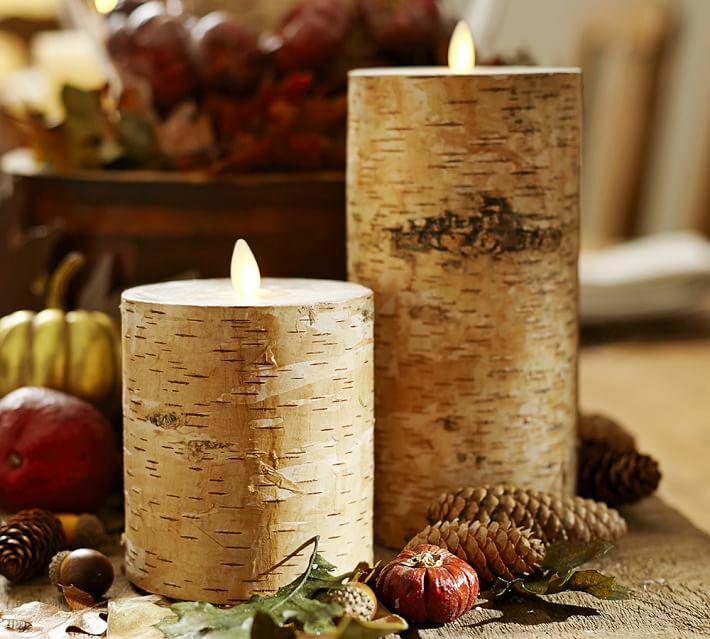 This wonderful collection of white birch candles are eye catching, yet understated. If anyone creates a natural centerpiece inspired by this idea, I’d love to see your pictures! Handmade decor pays tribute to craftsmen and artisans who create beautiful things using age-old techniques and practices. It rejects factory-produced decorative accents and embraces natural beauty and traditional craftsmanship. And what better way to start decorating in this theme than with our beautiful handmade Ivy Lace tablecloth, painstakingly created by skilled artisans. 1. Ivy Lace Tablecloth. 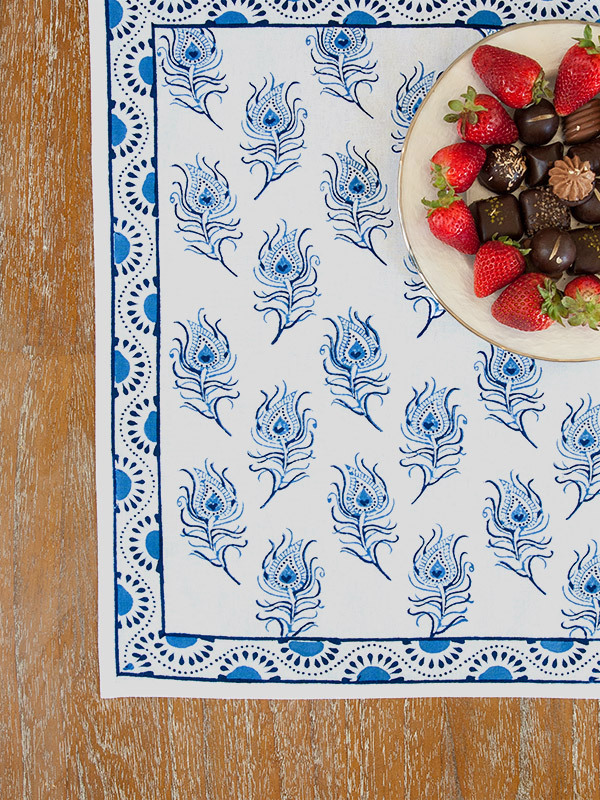 Add flavor and drama to your table with this chic and easy tablecloth. Like a natural envelope over the table, it won’t distract from the colors on top of it. 2. Peacock Tales Dinner Napkins. Handmade and festive, our sky blue on white napkins will be lovely against Ivy Lace, and accompanied by all the bounty of the season. 3. 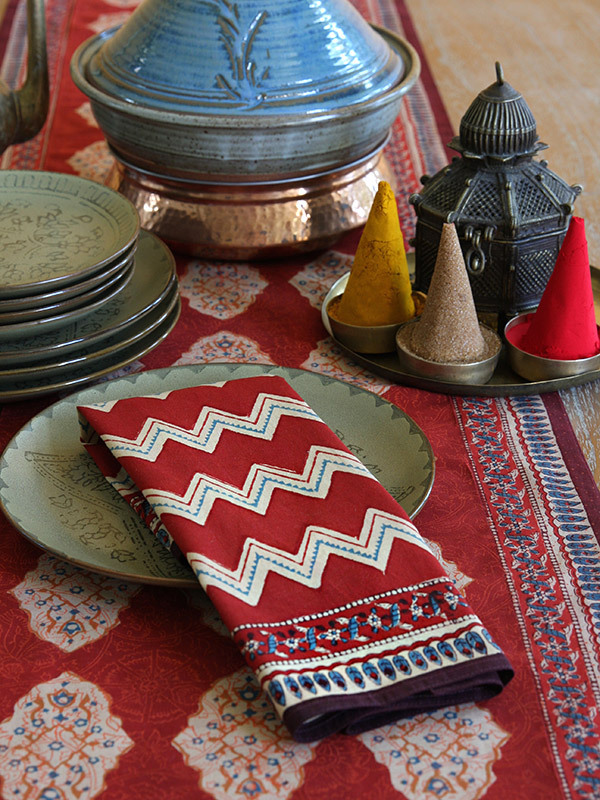 Herringbone Coral Napkins, Pomegranate. Covered in ferns printed in deep green, these cloth napkins reduce waste and add a special touch to your holiday dinner. 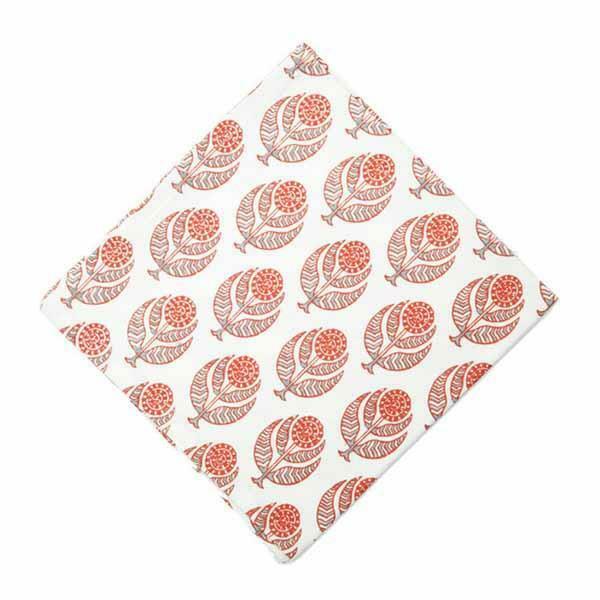 As the Madder Root artist says “These napkins can also be used to cover rising bread and they make a wonderful hostess, house warming, or wedding gift”. How wonderful! 4. 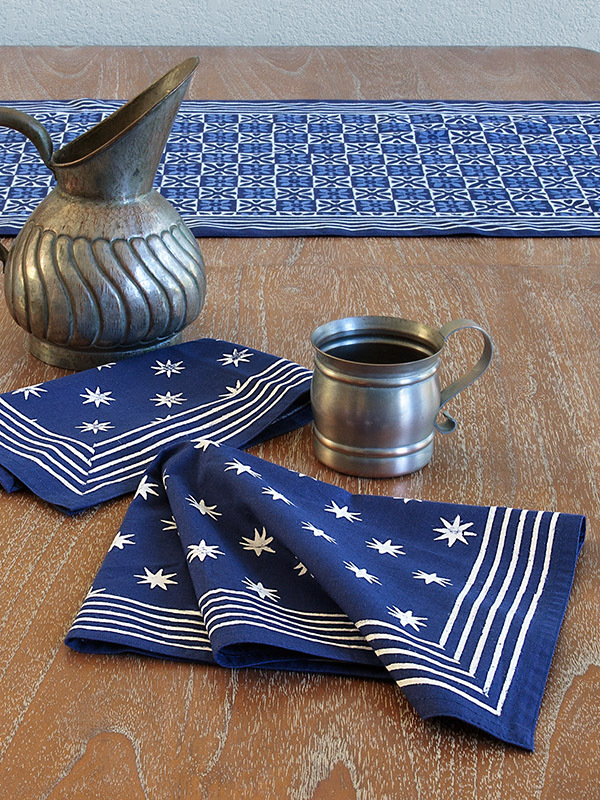 Mood Indigo Dinner Napkins. Pick up the bright white and florals of Ivy Lace in our hand printed indigo and white dinner napkins, scattered with exquisite bouquets. Sometimes the addition of a single handmade object can change the entire feel of a room. Handmade accessories are imprinted with the stories of the people who make them, and add whimsy and a ton of character to a room. Look for accessories that have interesting shapes, like pottery and vases, that are to scale with the rest of the display. 2. White Ceramic Plate Set, Free Folding. Layer earthy elements to achieve a warm kind of minimalism. These unique handmade pieces create a subtle ebb and flow of color and texture. 3. 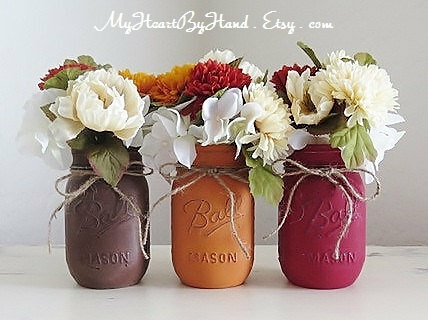 Distressed Mason Jars, My Heart by Hand. Even in thoroughly modern spaces, a touch of nature can introduce a certain softness and balance to sleek surfaces and angular corners. Fill these vintage jars with dried twigs, stalks of berries or winter wheat. Global decor blends a mix of international cultures into one cohesive, eclectic home. Allow countries’ treasures to mingle. It is much more interesting to mix them up rather than group all goods from one country on one shelf and so on. Roll with the punches here, using every Saffron Marigold napkin you have. 1. Ivy Lace Dinner Napkins, Fabric dinner napkins always make a meal special, but make your holiday meal a fine dining experience wit these lovely all white creamy napkins. 2. Sultan’s Palace Dinner Napkins. 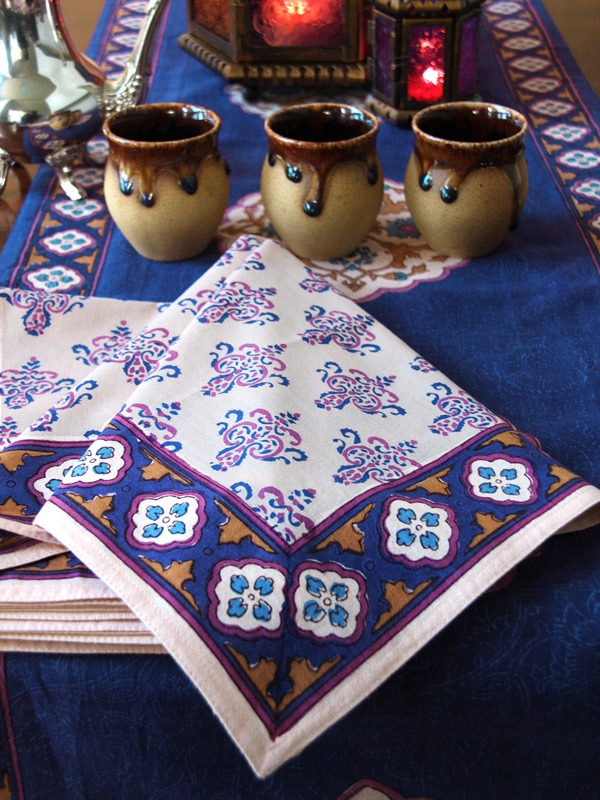 Ramp up the global feel with Sultan’s Palace napkins in delicious shades of fuchsia, turquoise and ocher. The rich jewel tones against a creamy background will coordinate beautifully with Ivy Lace. 3. Spice Route Dinner Napkins. 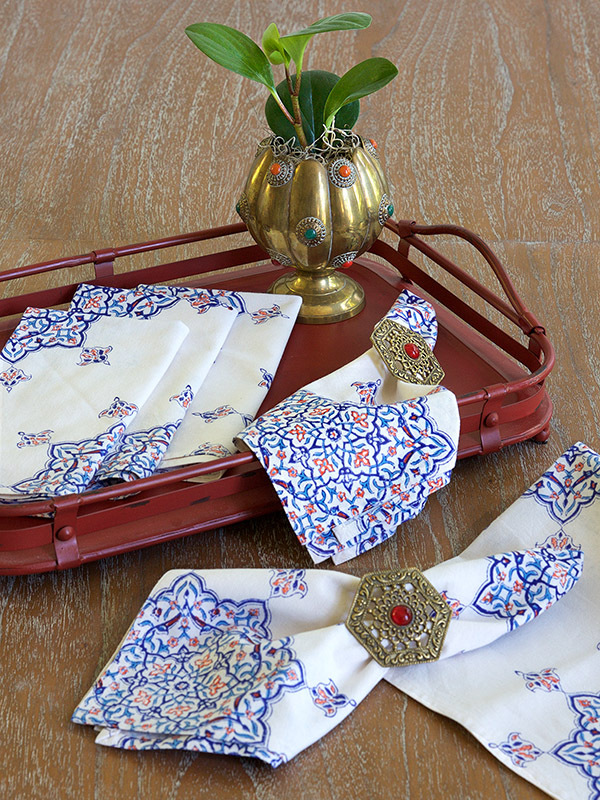 Another one of our Eastern inspired favorites, Spice Route napkins will bring all the color and allure of a bustling Moroccan bazaar to your table. 4. Midnight Lotus Dinner Napkins. 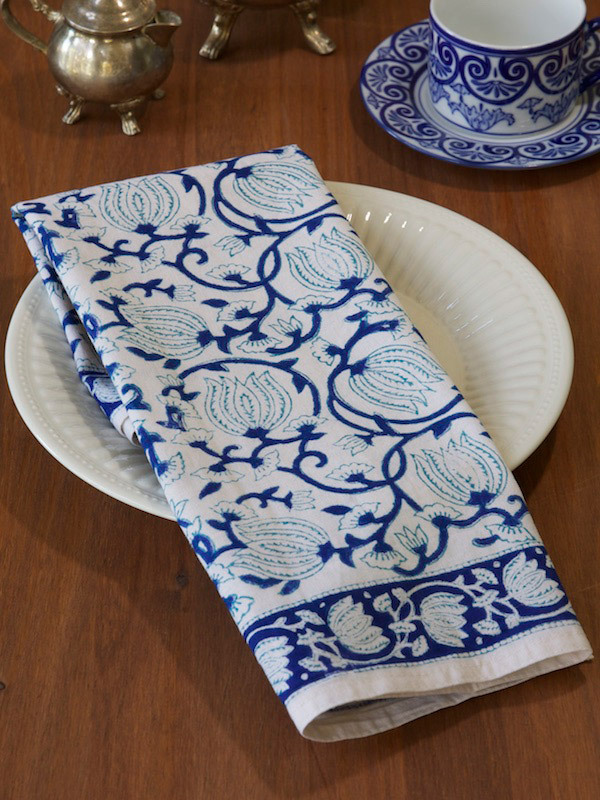 Echoing the scrolling pattern of Ivy Lace, these cheery blue and white napkins from the Midnight Lotus collection are a must. For accessories, look for pieces with great color, interesting texture, and a handmade look. But remember not to overdo it, a few pieces here and there will set the theme. Moroccan ceramics, Indonesian textiles, African masks, Indian textiles, all agains a neutral backdrop–these are all fabulous ideas to bring some hot Global flair to your room. 1. India Rose Euro Sham. 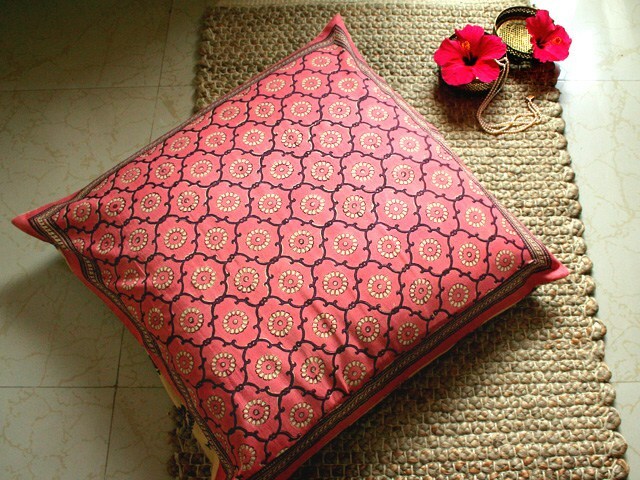 Inject a dose of vanilla and pink by tossing a few India Rose euro shams around. Make your guests feel perfectly at home, and encourage them to take their shoes off and relax barefoot on these pillows. 2. Folk Pad Printed Bowls, West Elm. 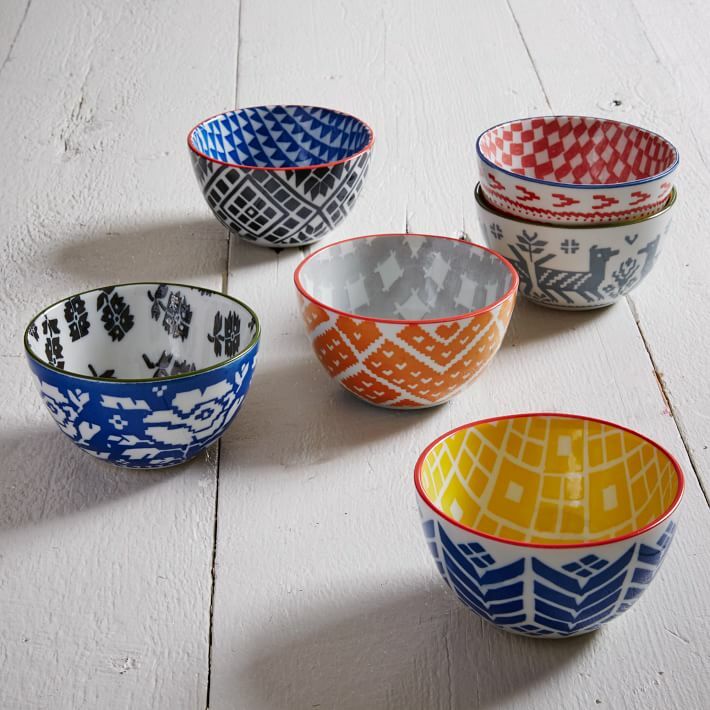 Mix and match these colorful, hand printed bowls with wild abandon for a brightly global look at your festive table. 3. 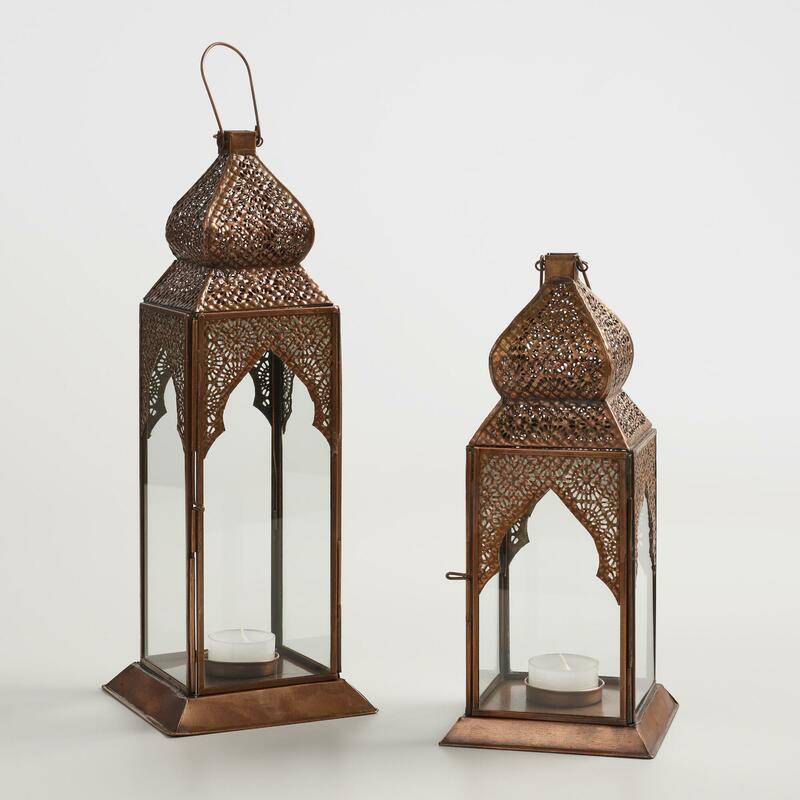 Layla Tabletop Lanterns, World Market. Now this is truly global. Surround a lantern like this with pinecones, colorful leaves and tiny acorns for a seasonal centerpiece that has an understated, exotic vibe. 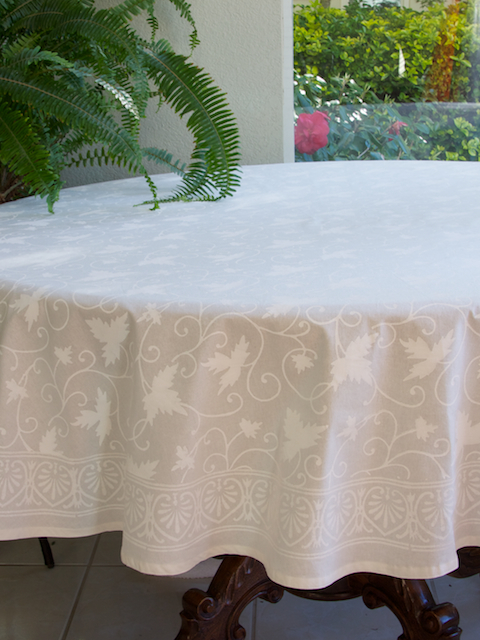 The Ivy Lace white tablecloth is perfect for my Thanksgiving table! It will be the perfect base for my gold chargers and white china with gold trim. And, my special centerpiece this year will feature my new Jonathan Adler Peacock Lollipop holder masquerading as a turkey (will be holding feather shaped lollipops from Sweet Factory). Then the Ivy Lace white tablecloth will again be the base for my Christmas table with green chargers, Grandma’s red and white Lenox Christmas china, and the peacock lollipop holder centerpiece (this time holding red & green mini christmas tree lollipops from Sweet Factory). I can’t wait! What an amazing table! I have to google the Jonathan Adler piece immediately – sounds so cool! 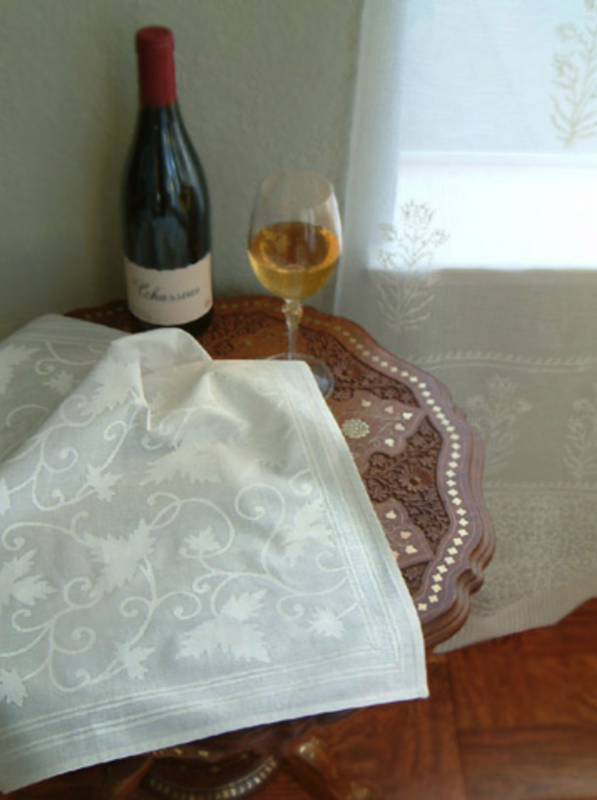 I’m really glad you’re considering adding our Ivy Lace tablecloth to your decor – I think you’ll be very pleased. I’d go traditonal with Ivy Lace. 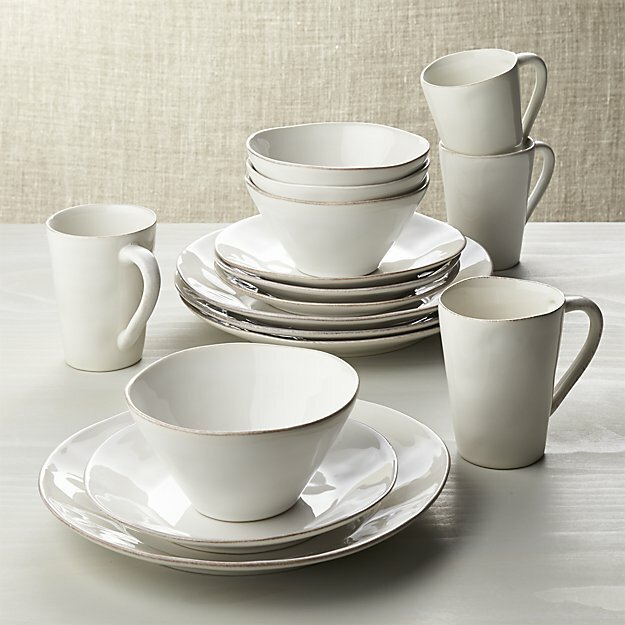 My formal china has a gold band that would look lovely. With a cut crystal vase filled with white roses and greenery, I would have a beautiful table. I’m going pink with this. I know it’s not traditional Thanksgiving, buy my Grandmothers old transfer wear would set a festive scene. Alabaster candle holders and a white platter adorned with silver gilded pears and cranberries. Matches my curtains! Something about the white-on-white that is so soothing. I would use white votives with this, and let the color of my golden walls be the contrast. 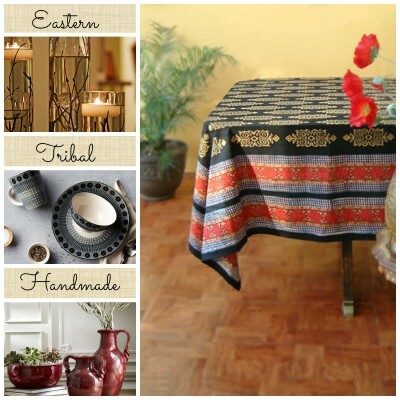 the great thing about this tablecloth…….any kind of centerpiece would look perfect with it!